After getting my package, I looked at the box, and thought to myself, "Did I really buy this polish? I don't remember doing so..." It's not that I dislike the polish, but grey isn't my favorite color. Boy, do I regret thinking that since I love this polish! It applied perfectly! Also, I was moving this past week (hence my being away for a day), and I was wearing this polish. After moving out and into a new place, I had one tiny chip on one finger. I could hardly believe it! I just love this grey shimmer. Today is the first day of the Barielle Fall/Winter 2009 Collection (called the All Lacquered Up Collection). Up first is the shade Get Mauve-ing. It is a beautiful dusty purple (ahem, mauve!). Unfortunately application of this polish wasn't the best. It was very thick, and needs to be thinned a little bit. Otherwise this was a great polish! Today is another from Diamond Cosmetics called Chain Mail Charm. This is probably one of my favorite polishes. It is a charcoal gray holo (perhaps it is just a black color with lots of silver holo glitter?). Either way it is beautiful and deserves 2 pictures. No application issues at all, and this was 2 coats. Tomorrow I plan on starting the swatches from the Fall Collection from Barielle. I have 5 from that collection and one other Shade polish to show. Hopefully you will enjoy them as much as I did! Diamond Cosmetics is a wonderful company that has very affordable nail polishes in a variety of colors. Most polishes are $2 and are very pigmented. I'm not feeling so great today, so I'm going to keep this short. 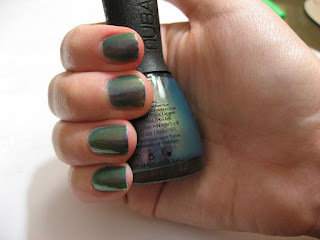 Don't Teal My Heart is a great teal creme that applies darker on the nail than in the bottle. No application issues at all, and this one is completely opaque in 2 coats. Give Diamond Cosmetics a chance if this is a new company to you! Today is a frosty shimmer called Blushingham Palace from OPI. This is one of those polishes you have to take care in your brush strokes so that the lines do not show. This is two coats and applied liked a charm with the wide brush they have. I have a soft spot for pinks and this one does not disappoint! This picture is awful, I know. I used a different light and it really washes me out. This is the only one like this. Drew is from the Truth Fall 2009 Collection and is a nice pink color. Zoya calls it a metallic finish, but I'm not sure it is since it is a shimmer (actually all of them are shimmers with the Dare Collection being mostly cremes). It's not my favorite color from Zoya, but it is still nice. It was opaque in 2 coats for me which is always a plus. This post is technically for tomorrow since I will be out of internet range until Thursday. Have a great Wednesday everyone! Better late than never! Here is a little review of the process I do to prepare my nails. I am a huge fan of Zoya Remove + mostly due to its flip top cap that you press down to dispense the (non-drying) acetone remover. It is a little pricey, I understand, but I'd say try it once to at least have the bottle to refill. I tend to find the scent of it not as annoying as normal acetone, although my husband still finds it pretty strong. Next on the list is a basecoat. I find that basecoats are vital to stop staining of nails as well as to inhibit chipping. I first tried a Sally Hansen basecoat/topcoat, but that did not dry fast enough. I went to the Seche Vite basecoat, but I found that I had too much chipping and stopped using it. I really enjoy the Zoya Anchor and it works just fine. Lately my nails have been peeling a little, so I use a Ridegefiller from Orly to smooth out the surface before polish. It is not as thick as I thought it would be, but it still works nicely. Finally, to the nail polish application! I often like to use 2 coats (unless it is too sheer and needs more) since I get impatient. In my opinion the topcoat is the work horse of the whole process. I tried that Sally Hansen base/topcoat, but that wasn't great. I heard wonderful things about Seche Vite, and it is great, but I found that I was having shrinkage problems. Another issue is that it is not three free and has toluene. I use Poshe Topcoat now and I think I will stick to it. No shrinkage and it is three free. It does tend to get a little thick over time, so it is good to invest in a bottle of polish thinner. I hope this helps in case anyone was interested in what I use! On to the polish of the day: Essie Rock Star Skinny is really hard to describe. 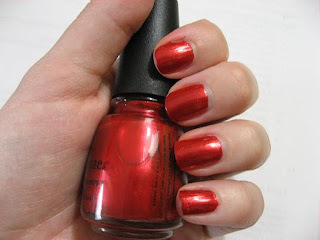 It is a vampy red/brown color that is drastically different than the other polishes I have. It sort of surprises me that this is from Essie since they normally stick to sheers, pinks, and reds. No application issues and this is 2 coats. When I woke up this morning, I felt like posting 2 polishes instead of the normal 1. Today I have 2 polishes from Zoya. The first is a blue shimmer called Tart (perhaps for the color of a blueberry?). Please try to ignore the tipwear since I had been wearing this one a couple days before being able to take a picture. No application issues and this is 2 coats. At first I thought Zoya Valentina was going to be a little too safe for me. My husband actually picked it out for me, so I really wanted to love it. Turns out I do! It sort of teeters between pink and red (which for some reason I don't often wear red colors), but I still love it. The formula on this was normal. I may take this weekend to discuss removers, basecoats, topcoats, etc. I haven't used a wide variety of types, but I will talk about what seems to work for me. I'll be the first to admit that I was dubious of matte polishes. When the offer for three free polishes from Zoya came around, I decided to go ahead and try their matte polish (that way I wouldn't be out of any money if I didn't care for it). Zoya Posh really is beautiful. That said, it was difficult to apply. Like most matte polishes, they dry very quickly. You really need to work fast and it is hard to get the area around the cuticle. I used a basecoat (Zoya's Armour) because these polishes are known to chip easily. As you can see from the bottle, the bottle is frosted, and the cap has sort of a rubberized grip to it (similar to that used by Orly). Today is a brand new company to me called Quirius. I found out about them from a fellow blogger, Mary, who has a wonderful blog called Body and Soul. She also has a code for $3 off any order, so if you want to try them, now is the time to do so. Application on these was wonderful! As you can see from some of the pictures, a few of them are neons which dry matte. Looking back at the pictures, I should have included a picture of the polishes with a topcoat-sorry! Autumn Bronze and Cresskill Ave are definitely great ones for the fall and I can't wait to wear them! The Arabian Nights is not a holo, but a light glitter that wasn't too difficult to get off. I'm not a fan of plain black polish, but the glitter makes this one very wearable for me. The best part of Quirius? The price! They are $3 apiece, but if you order a set of 6, the price is only $15. This is not including the $3 off coupon code from Body and Soul. When I ordered they also threw in a free topcoat! Can't get any better than that. You can purchase the polishes from their website here. Today is a fun purple shimmer from BB Couture called Psycho for your Love. Application was great like most BB Couture polishes. I think this one reminds me of a darker version of Pasadena Purple from Nubar which is also a favorite. Hopefullly tomorrow I can swatch a brand new (to me) polish company! The best thing about OPI? Their pro wide brushes! I'm sure some will disagree with me, but they work so well for me. This is the first DS polish I've tried, and I must say, I need many more! I absolutely love this color, application, and holo. It is a shimmery rose color that was perfect in 2 coats. I hope you love this one as much as I do! On a different note, Overall Beauty has a sale on BB Couture. It is currently buy 3 get 1 free (put free one in the notes with a max of three polishes). If you signed up for the newsletter, you received an even better deal! Entourage is a lovely bright green shimmer from the China Glaze Kicks Collection. The picture is two coats. I can understand how this could be a little too "out there" for some people, but like many, I've been on a a green kick lately. As I remember, the application on this polish was really great. Happy Friday!! Love Drunk in a beautiful brink pink shimmer from BB Couture. Not much else to say about it except it had great application with 2 coats. Feel free to comment on any or all colors. If you have any questions, please e-mail me at rightonthenail@gmail.com. I hope you enjoy the blog as much as I enjoy swatching them! I love green! I guess I am more of a shimmer fan, but this creme is definitely awesome! Perhaps part of the reason why I like shimmer more is because it is easier to apply. Anyway, this is Poison Ivy from BB Couture. It is completely opaque in 2 coats. The picture above is with no topcoat...look how shiny that polish is! I love it! I really love the polishes from BB Couture. They are really starting to broaden their color palate and their application is always top notch. Today is the blood red Fairy Blood. It contains red glitter in it (but doesn't make it too difficult to take off) and contains a hint of black. Several other companies have a glittery red and they name it Ruby Slippers, etc. Not BB Couture. You can buy their polishes from Overall Beauty and if you sign up for their newsletter, you often get coupon codes. Today is a beautiful pink, chunky holo from China Glaze called Don't be a Square. I say it is a chunky holo because the glitter is not quite as fine as the OMG! Collection or the OPI DS. You'll be happy to know it is not difficult removing this polish as it does with other glitters! Application was wonderful and it was fully opaque in 2 coats as shown. Let's Groove is also from the Retro Diva collection. As you can see, it is a beautiful deep purple shimmer. There is no question that this is a purple; it doesn't look black in other lights. It was opaque in 2 coats (as shown here). It was only slightly thick, but I overall had no application issues. Overall, if you are a purple fan, you will definitely love this polish. I don't know if it really screams 70s or retro, but it is really beautiful. This is a second swatch from the Wet N Wild Craze collection. Morbid, on first glance, my look like a normal black polish, but it in fact has a teal/green shimmer in most lights. Application, like Inferno, was no problem at all. The picture shown is 2 coats. Again, for $1.99, it's totally worth it. Today's polish is Drive In from China Glaze in their new Retro Diva Collection. I have a couple more polishes from this collection to swatch. For those of you who do not order your polishes online, you can purchase China Glaze and the Retro Diva Collection from Sally's Beauty Supply stores. The picture of Drive In is two coats in artificial light. It is a beautiful coppery red color. I had no notable application issues, but it somewhat stained the edges of my fingers when taking it off (but not on the nail bed). I'm sure all of you have used Wet N Wild over the years. Heck, with the great price, why not have a few around at all times? This is from the new Craze collection that has just been released. I am thoroughly impressed with the bottle and application of this polish! The brush and cap are a little on the short side, but the brush is pretty wide which made for easy application. Also, the polish wasn't too thick or thin. Another plus is that it is 3 free! I had no idea! For the low price of $1.99, I definitely suggest picking up a few from this collection. So far this set can be found at some WalGreens and Meijer (for you girls up north!) but it is pretty much just found in random areas right now. 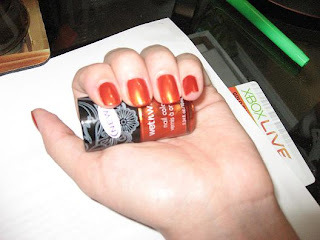 Inferno is a coppery red shimmer (picture above is two coats). Right now I only have one more from this collection to swatch. Today's swatch is Midnight Glory. It is another duochrome of light purple/pink/gold. This is a nice subtle polish that would be very appropriate for work. Also, this was three coats, so it is not the most opaque polish. I do want to quickly mention how much I like the bottles of the Nubars. The handle on the brush holds well in my hand, and the brush is not too big and not too small. I decided to show my whole Nubar haul (from left to right): Midnight Glory, Peacock Feathers, Love Rainbow, Hot Lime Green, Indigo Illusion, and Cupcake Magenta. The mani for today is Indigo Illusion. In the bottle it is a purple/green duochrome. You may remember from my first post that Peacock Feathers is also a purple/green duochrome, but from the picture, you can definitely see the difference between the two. Indigo is more of a lavender purple, whereas Peacock Feathers is closer to Pasadena Purple from Nubar. 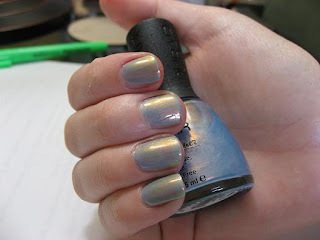 The photo of Indigo Illusion is two coats with no topcoat. It's not my favorite the Nubars, but it is still a nice polish. Today is a bright pink color called Cupcake Magenta from Nubar. The picture is two coats without topcoat. This was a quick swatch so I apologize for the state of my nails. Also, I'm still working on the best way to take the pictures so bear with me. As with all Nubar polishes, I had no problem with application. The next few days may also be Nubar related since I bought several polishes from Lotion Source. They have a limited selection of Nubar polishes, but they are about $3 cheaper than straight from Nubar (and they are not often found in B&M stores or salons). Either way, Nubar is awesome no matter where you get them! I'm thinking of starting a blog dedicated to nail polish. Yes, it's weird, but I love being able to look at colors before buying and learning about new companies. It's getting really late tonight (I was out watching Funny People), but hopefully I will be able to swatch the color I have on today. It's from the company Nubar which is a new favorite company of mine. Their formula applies like a charm for a 3 free company. Tonight I'm wearing Peacock Feathers which is an awesome duochrome of purple and green. I love it! Hopefully i will have a picture up very soon! Anyway, I'm sure nobody reads this, but let me know if you are interested!